Sometimes things may appear to work when actually they don't. Many years ago, I was working for Georgia Tech and wrote the book, Radiant Cooling to the Night Sky. It didn't make the NYT Best Sellers list. Maybe we can dispel some misconceptions without a lot of fussy math. Reflective surfaces like Reflectix only work with an air space. It can be a very tiny air space but if the reflective surface touches, all heat transfer is by conduction and the reflective surface has no benefit. The R-value of Reflectix is about 1.0. That's roughly equal to the same thickness of cardboard. This amount of insulation is only delaying the inevitable temp equalization for a few minutes. Radiant heat transfer is only a function of surface material. If you paint Reflectix, the emissivity is now that of whatever you painted it with. What we actually want is stable OTA temp. It doesn't much matter what that temp is but it's almost impossible and certainly very impractical to achieve when using the OTA. So, we settle for ambient temp with the assumption that it changes so slowly that we won't create tube currents and can call it stable even though it changes somewhat through the night. The faster you cool the OTA to ambient, the sooner you eliminate tube currents. The OTA will reach ambient and insulation only delays it a few minutes. Insulating the tube actually creates more currents but we're getting pretty picky at that point. The big issue is radiant cooling to the night sky from exposed elements of the optical train which are aimed at deep space creating a huge delta T and the situation that we are generally observing under clear skies which reduces atmospheric attenuation and gives us pretty much maximum radiant transfer from the OTA. We are dealing with very small amounts of energy here. The transfer doesn't correlate well with anything except sky temp. When you simplify a lot of data and math, the cooling can be expressed as (-0.59 * Sky temp) + 44.21. In English, about 11 Btu/hr-sf which is about 3 watts. That's about a dozen wooden kitchen matches per hour. It doesn't take much of a dew heater to overcome that. If the case of a refractor or SCT, without a dew shield, the front optic is exposed to a large part of the sky dome. With a dew shield it's seeing only a small fraction and heat loss is greatly reduced. It's not about insulation of the shield, it's just about blocking as much of the sky dome as practical. If we get into really tiny numbers, the dew heater does create a warmer boundary layer of air at the front optic (on both sides). A dew shield with insulation does protect that boundary layer but the first little breeze pretty much wipes that out regardless of how much it insulates. If you split hairs, the bottom of the OTA is receiving heat from the ground while the top of the OTA is losing heat to the sky which creates a very tiny difference in tube temp and a very tiny convective current. Insulation won't stop that either. There is no reason for Reflictix but if it works you, by all means use it. It would be interesting to to take a useless SCT and put thermocouples in the tube and on the optics and actually measure what's going on with different configurations, angles, and sky temps. Until then, the numbers are just too small and the variables too great for a conclusion. John touched on sky temp and it, like most of this, isn't necessarily intuitive. Sky temp does not represent any actual atmospheric temp except by coincidence. It is defined as the lowest temp a horizontal grey body radiator can reach in the absence of conduction and convection. To complicate things even more, it changes constantly and can vary up to 20 degrees in 24 hours. 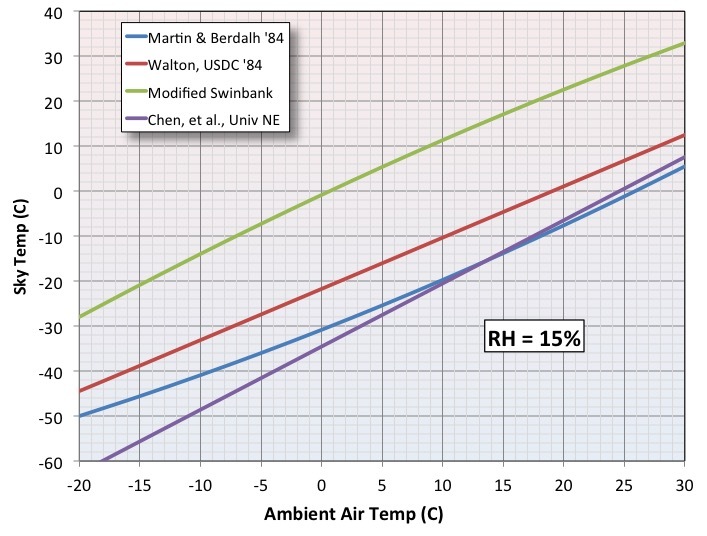 Swinbank developed an equation for it based on local air temp. Bliss developed an equation based on water vapor content near the ground and local air temp. Swinbank winds up about 10 degrees below Bliss and Bliss is about 8 degrees below actual hourly measurements of the Geophysical Sciences Department at GT. That's if it's cloudy. If clear, the predictions compare to actual in just the opposite way. There are just too many transient variables. What works on paper doesn't correlate well with real life. After a lot of data collection, atmospheric modelling, and empirical experimentation, I tried fitting a curve to the data so that prediction could be extrapolated but, even after taking it to 12 degrees, I still wasn't happy with the correlation. Someone mentioned MatLab and that, or maybe even ANSYS might help but you will need the most robust atmospheric modeling module to even get close. If we can only predict the whole atmosphere with about 5% accuracy, think how the margin of error gets astronomical when we only look at a FOV of 2-3 degrees. Monitoring a real scope is, I think, the only way to get any useful knowledge here. In the mean time, keep experimenting and see what works for you. Where an OTA's internal thermal issues (e.g. secondary heat plumes, tube currents, etc.) can be directly observed in an out-of-focus star image one can easily note, record and image the effects of one's countermeasures (e.g. fan off, fan on, reflectix off, reflectix on, etc.) in real time. In my own personal experiments with (mostly) solid-tube Newtonians and a C9.5 and a SW180 Maksutov I've found the two latter closed-tube telescopes to be the most problematic for OTA thermal management. Where the Newtonians could all be thermally managed with a simple behind-the-primary-mirror fan setup, the Catadioptric scopes have defied my best efforts, so far, with various external tube insulation schemes (e.g. cardboard, foam rubber sheets, dew shields, etc.. I'm just at the initial stages of playing with Refectix, so I have no opinions as to its effectiveness at this moment). My suspicion here, in regards to thermal management in closed-tube designs, has been leaning towards active through-the-tube's-length ventilation (ala Newtonians) of those OTAs vs insulation as the likely solution. I say this as in my reading here on the boards it seems to me that the owners of those Maksutovs from TEC and Intes Micro Alter that provide both Corrector and Primary venting and fans in their OTA designs the issues of thermal management seem moot. Likewise, the numerous posts and articles from folks drilling flow-through holes and mounting fans in their SCTs seems to show similar success. At this point I'll be playing with the Reflectix through this winter and into next summer and see how it affects performance. Otherwise it's back to the drawing boards and talking with my local machinist about some mods. I totally agree. Here's the problem that anyone will face in in trying to predict temperature drops with any accuracy. There are a LOT of models for night sky emissivity (I think that I have about eight) and/or the irradiance incident on a surface under the night sky. You can use any of these models to compute the expected value for the temperature of the night sky, which will depend on the humidity/dew point, the cloud cover, the elevation of the site, and the zenith angle (if you want to include that.) Here is a plot of the computed sky temperatures for just four of the models that I've looked at computed for 15%, 40%, and 90% relative humidity (straight up at sea level.) Swinbank's model shows the temperature of the sky going above the air temperature at low humidity and high temperature, which might be right but I find troubling. Martin and Berdahl did a very comprehensive study in 1984 that covering the whole US to develop their model so I'm more inclined to use their results, which don't ever show the sky temperature going above ambient and seems to handle the low end a bit more consistently than Chen, et all. Edited by jhayes_tucson, 02 December 2018 - 02:58 PM. Your IR gauge is about right. There’s a source of REAL DATA too - “aerological diagrams” which are produced by the weather bureau in your country based on data from weather balloons, typically released daily for locations near major airports. 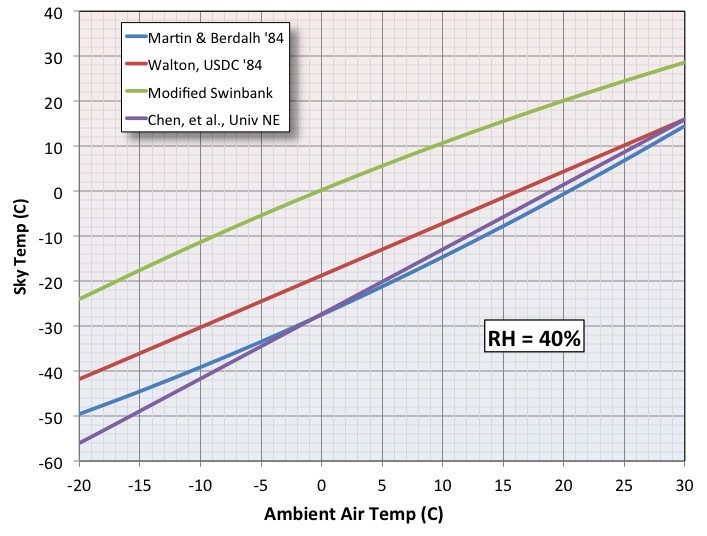 These charts show temperature and humidity of the air column to high altitude. Edited by luxo II, 02 December 2018 - 05:04 PM. I think one method of stabilization that has not been addressed here is what amateurs have been doing using internal air (inside closed tube SCT's). With three air fans mounted inside the telescope tube at 120 degrees and ducting the moving air from across the primary mirror to the front of the telescope and then recycling this air back and across the corrector. So no outside air comes into system. I believe the two systems I have heard about used "nacels" (tubes running on outside of telescopes from front to back). The air mixes continously until homogeniety will come to be. The system comes to equilibrium quickly. This seems a good approach and something that could be custom built to fit a number of telescopes. I believe these systems could be designed to fit inside the telescope with using fans mounted perpendicular to the tube walls on 'baffles' similar to what are being used in RC telescopes with ducting running between the baffles the length of the tube to the front and exhausting across or near the corrector. If this were possible, then there would be no need to put holes in telescope tube and the system could be removed if not wanted. This system could be installed through the front of the telescope by taking out corrector...The baffles could be designed to 'spring' into place similar to 'flocking' paper installation. I know their is not much room between the tube wall and the light path so this might be a problem. Possible food for thought. So what do you think is the advantage of circulating internal air verses outside air? This correlates precisely with my experiments with Reflectix. A single layer is borderline useless, unless separated by a nonconductive layer providing the air space. "The R-value of Reflectix is about 1.0". ????? And you found this 'fact' where...?????? As I've said, I think that using Reflectix without fans is only half a solution. I personally can't see any reason to recirculate internal air. It helps to dissipate convection within the tube but it won't do anything to speed stabilization--particularly if the tube is insulated. Circulating a small amount of outside air helps to do both. Sometimes things may appear to work when actually they don't. Yes indeed. Dowsing appears to work. It doesn't. Deer whistles on vehicles appear to work. They don't. Even astrology appears to work for those who believe in it. Of course we know astrology is a hot mess of nonsense. Wishful thinking, ego defenses, and confirmation bias often prevent us from seeing things clearly. Edited by Sarkikos, 02 December 2018 - 09:17 PM. I agree and that my friends is why I have both my SCT scopes wrapped with Reflectix and use Tempest fans in my Edge and a CatCooler in my 9.25". The fans themselves before I wrapped my scopes helped but my totally unscientific opinion is that using both the wrap and the fans reduces heat plume effect much quicker. Google is AWESOME... This is more, if you search for "Reflectix R-value". Yes, correct, IF you "don't provide an airspace", as Reflectix states on the label. A ''sealed' SCT tube, completely wrapped in Reflectix, is an airspace, and a decent one at that. It should be mentioned also, that there are at least 3 different thicknesses of Reflectix being sold near me (that I know of). A friend showed me what he purchased, and it was the thinest, flimsiest piece of ''coating" I had ever seen. Had to pull it apart just to satisfy myself that there was, indeed, some bubble pockets inside. That's NOT the stuff to use. I use 1/4" usually, and, as you know, it works wonderfully. "With multiple layers of product and airspaces between each layer, enhanced performance will be gained. If the product is simply “doubled” (with no air space between the layers), a very minimal benefit is obtained, (R-1.1 (per layer) for the Reflective/Double Bubble product)." So why do you guys think that an airspace is needed? Edited by choward94002, 03 December 2018 - 02:49 AM. choward94002 wrote: "so if the goal is "no thermals" then a sealed tube, no matter how well mixed, simply won't work …"
Really? Have YOU actually tried it? Or are your views just 'theory'? These discussions happen regularly and results are backed by confident claims that "it worked for me." But if the goal is really good optical performance under challenging thermal conditions - then what I would want to see is exceptional results by a given approach. If we just go by word of mouth then I can find good results by almost any approach. I think it's great that people are talking directly about radiative cooling - because that is a big step from models where the entire OTA and its contents are tracking ambient temperature - with no regard for either a dew strap or radiative cooling. This stuff is inherently complicated and a reasonable model would need to account for many factors. Now I would like to take it one step further and consider the specific thermal environment of the scope - since I think we agree here that radiation loss to the cold sky is a critical factor. If you are in a wide open field under a clear sky - the ota will be exposed to twice as much cold sky as if your horizon were only 30 degrees high - due to trees or buildings or whatever. And if you are up against a tree line or a building - you will also cut your exposure by 1/2. That, along with slight haze, combined with the temperature of those shading sources - will have a big effect on your radiation losses - independent of whatever insulation you have put on the scope. 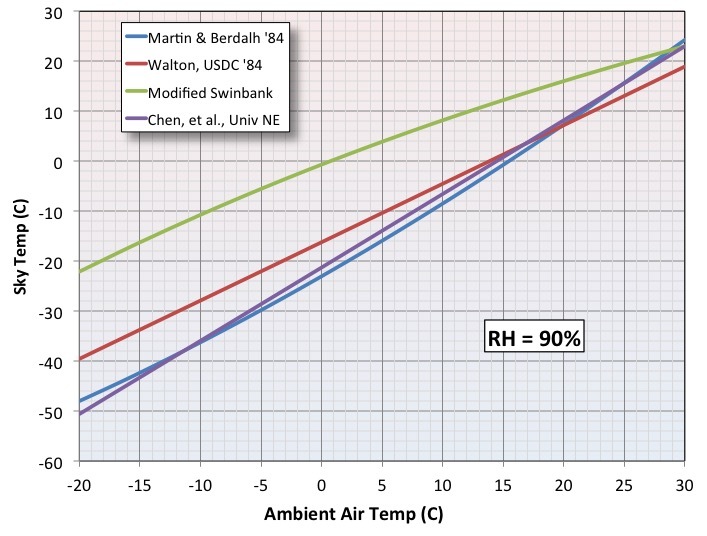 You cannot ignore the role of the thermal environment when describing and comparing these methods. As for insulation - that again is all over the map in terms of what people have been saying. When EdgeHD came out - people complained that the vents were too small to be effective. Later add-on fans came along - and people said they worked great. Now people are saying you should seal up the scope - and fans are bad - or maybe they're good - I think it depends on how they're used. Yet in an adjacent thread on EdgeHD vs. XLT, the big problem with EdgeHD isn't the vents - but the field correcting elements - which seal the scope and prevent it from equilibrating properly. And the claim is backed by the usual expert assessments and side by side comparisons - none of which ever yield objective data in the form of diffraction limited images or something. The thick corrector on a maksutov prevents it from working well due to its thermal mass. Or does the thermal mass actually help keep things stable? And what about the heavy metal weight in the Meade Mak. That's terrible for thermal equilibration - but maybe it's actually a good thing and we should all put them in the ota's - along with insulation. Based on the arguments and models in this thread - I can argue it either way. In my case I see no need to do anything different, since I am doing nothing special except common sense approaches that largely agree with long standing professional methods - and I back my results with diffraction limited views of the Airy pattern - along with other various thermal and focus studies. All I do is leave the scope outside under a telegizmos cover and uncover it as the sun sets. I have a dew heater on the tube just under the corrector and a short dew shield. The entire scope is well equilibrated with ambient and the top of the tube is very gently warmed to prevent dew and also prevent convective currents in the tube - which would otherwise happen if the top of the tube were cooler than lower parts. I don't have fans on the EdgeHD vents because I don't seem to need them - based on diffraction limited results shortly after set up. The motivation not to insulate is to help the entire system be overall as close to ambient as possible - so that no plumes form - especially in the chimney formed by the dew shield in front of the corrector. Yes - high thermal mass and insulation are bad in that context. I am fortunate that I am not driving out to a cold place with a telescope in a hot car - and I take it out and need to start observing. Anyone who wants to observe as quickly as possible with a non-equilibrated scope has some challenges - but if there is a magic solution such as insulation - I would like to see actual diffraction limited imaging results captured shortly after setup. In the meantime - if you are concerned about radiative cooling and want to slow it down - trees and nearby buildings help a lot, as does a patio umbrella off to the side - without touching the scope at all. I think the planetary imaging folks use a variety of methods - including active cooling of the mirror. Their results are backed by high res images that require very good seeing inside and outside the scope. So that is one example of methods backed by good results - and even then there are many different approaches that work well. Hmmmm… That's a rather long, detailed way of saying that the answer to the question I asked you is 'NO'. So, when you DO have the time, situation, $18, or other motivation to actually try it for yourself, let me know. Until then, you're theorizing. Is Reflectix Foil Insulation a Good Bet for Your Home? Reflectix's stated R-14 R values for exterior walls are good only if the Reflectix is paired up with R-13 fiberglass batt insulation. In fact, if you don't provide an air space, this product provides almost no insulating value. The rubber meets the road on Reflectix's website, where they say "No Air Space = No Reflective Insulation Benefit" (An R-1.1 is provided from the product itself for the Reflective/Double Bubble material.) If you've got air space, why laboriously suspend a shiny bubble wrap in the center of it when you can just fill it with far more effective fiberglass batt insulation? So, what should we conclude from this? - A layer of high R insulation should be positioned between the OTA and the Reflectix. Are these conclusions correct? Or are they incorrect? Why? Also, if we're going to use a high R insulation between the OTA and the Reflectix, what should we use? I don't think I want to place R-13 fiberglass batt insulation around my OTA. Edited by Sarkikos, 03 December 2018 - 08:02 AM. This is why venting with fans is a good idea if you want to eliminate - or at least reduce the impact of - thermals, whether or not the OTA is covered with Reflectix. Edited by Sarkikos, 03 December 2018 - 07:49 AM. Refocusing is only a real problem for imagers. It should not be a big ordeal for visual observers to refocus every 15 minutes.